The VMAR J3 CUB & L4 Grasshopper 09-15 ARFs are officially semi-scale but when you see the detailing you will think they are miniature version of the real thing! Intended for either Electric or Glow Power the VMAR J3 & L4 are both perfect for a 75-150w brushless motor or small .09 - .15 glow engine. With a flat bottom wing, mild dihedral and light wing loading the VMAR J3 & L4 are quick to assemble and easy to fly! The VMAR J3 & L4 09-15 ARF ECS is built using select light weight balsa, lite ply and other structural woods... no foam! Simple to transport and perfect for small fields. When equipped with a 1800 mAh 3cell LiPo battery and a brushless motor the VMAR J3 & L4 can fly for 10 minutes and much longer when throttled back! These models are Laser Cut using our state of the art precision cutting system. 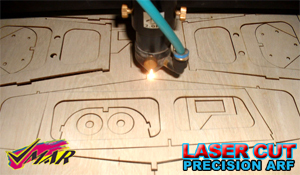 Nothing beats Laser Cutting for precision. Best of all the VMAR J3 & L4 utilize the revolutionary Ultratough POLYCOTE ECS Enhanced Covering System. POLYCOTE ECS is a brand new Enhanced Covering System engineered in Canada specifically for use only on VMAR ARF models! POLYCOTE ECS is a complete proprietary system that utilizes Ultratough Polyester, enhanced graphics and detailing inside the covering and very minimal Sure Seal Seams to produce a totally fuel proof, high strength, lightweight, ultra durable covering. POLYCOTE ECS is toughest polyester based system ever used on a model! The graphics and detailing are inside the POLYCOTE... not stuck on top! No Decals! No Layers! No Strips! No Stripes! No Drag! The VMAR J3 & L4 10-15 ARF ECS utilizes POLYCOTE ECS to ensure that you have the best in covering and that the detailed graphics stays looking as good as new for the life of the model! Covered with POLYCOTE ECS to give you a strikingly beautiful and high visiblity model without the need for decals! All the graphics are inside the covering! Pre-hinged Control Surfaces... Factory Installed and Pinned! Quality Engineered by Modelers for Modelers! Only from VMAR Manufacturing... setting the standard in Affordable RC products. Power Module for easy motor installation! Pre-installed Pushrods and Control Surfaces! Full Color Illustrated Assembly Manual! Production Colors and Graphic Schemas may differ from that shown.